What did the Sumerian people wear? Here are some tantalizing pictures…. Ancient Mesopotamia was situated in the area of land that is defined by the two great rivers the Tigris and the Euphrates and that is contained within modern Iraq. Several important cultures arose there, their empires waxing and waning successively as well as overlapping in time. Among the most prominent were the Sumerian, the Akkadian, or Semitic, the Assyrian, and the Babylonian. The Sumerian civilization was established before 4000 BC and reached a high level of culture between 2700 and 2350 BC. In early times both sexes wore sheepskin skirts with the skin turned inside and the wool combed into decorative tufts. These wraparound skirts were pinned in place and extended from the waist to the knees or, for more important persons, to the ankles. The upper part of the torso was bare or clothed by another sheepskin cloaking the shoulders. From about 2500 BC a woven woolen fabric replaced the sheepskin, but the tufted effect was retained, either by sewing tufts onto the garment or by weaving loops into the fabric. Named kaunakesby the Greeks, this tufted fabric is shown in all the sculptures and mosaics of the period, as, for example, in the art from the excavations at Ur exhibited in the British Museum in London. At this time, also, long cloaks were worn, and materials for garments and head coverings included felted wool and leather. Men were generally clean-shaven. Both sexes seem to have often worn large wigs, as in ancient Egypt. Metalworking was of a high standard, as may be seen in the elaborate golden jewelry, which was encrusted with semiprecious stones and worn by both sexes: brooches, earrings, hair ornaments, and neck chains. A different style of dress is evident in Mesopotamian sculptures dating after about 2370 BC. Both men and women were clothed in a large piece of material–most commonly of wool, though later also of linen–draped around the body over a skirt. This garment, similar to a shawl, was characteristically edged with tassels or fringe. The draping varied, but, for men at least, the fabric was arranged so that the fullness was at the rear, leaving the right, or sword, arm free. This newer form of dress had originated from farther north and east and was adopted by the Semitic people of Akkad under Sargon (the dynasty founded by Sargon lasted from c. 2334 BC to c.2193 BC) and by the revitalized Sumerian culture in the years 2110-2010 BC. 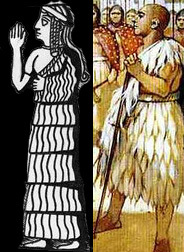 The dress worn in Mesopotamia by the Babylonians (2105 BC-1240 BC) and the Assyrians (1200 BC-540 BC) evolved into a more sophisticated version of Sumerian and Akkadian styles. Ample evidence of this more elaborate draped costume can be seen in the large relief sculptures of the age. There were two basic garments for both sexes: the tunic and the shawl, each cut from one piece of material. The knee- or ankle-length tunic had short sleeves and a round neckline. Over it were draped one or more shawls of differing proportions and sizes but all generally fringed or tasseled. Broad belts held the shawls in position. Wool was the most frequently used material, in bright or strong colors. Decoration was rich, in allover patterns or in borders, carried out in embroidery or by printing. Motifs were chiefly geometric. Women wore a short skirt as underwear, men a loincloth. Footwear for both sexes was made from fabric or soft leather in the form of sandals or boots. Care of the coiffure was very important for men and women among both the Assyrians and the Babylonians . The hair was grown long and carefully curled and ringleted, with false hair added if needed. Perfumes, oils, and black dye were used on the hair. Men grew long, equally carefully tended curled beards. A band of metal or fabric encircled the brow, or a woolen, felt, or leather cap shaped like a fez was worn. The royal headdress resembled a pleated crown or a mitre and had dependent lappets at the rear. Jeweled ornamentation to the costume was rich and heavy and of high quality. 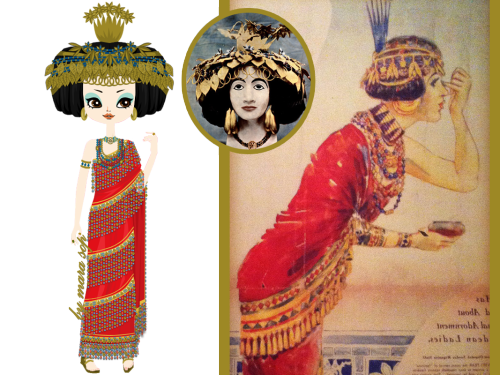 My Research Writing and About Ancient Mesopotamian life Clothes in Sumer Sumer Sumerian Sumerian women What did Sumerians Wear?